Yael Deckelbaum is an award-winning Israeli/Canadian singer-songwriter and activist. She is a founding member of the legendary trio Habanot Nechama, who had a #1 hit in Israel, with their single “So Far” and sold over 50,000 copies of their album. Yael has written and composed the song “Prayer of The Mothers”, that turned into the anthem of the march of hope, lead by the movement “Women Wage Peace”. Yael has performed on the same stage with Sir George Martin, Suzanne Vega, Chris Kornell, Livingston Taylor, Tom Chapin (3 x Grammy winner), Bobby McFerrin and Matisyahu. Three of her songs have been featured on the internationally acclaimed “The L Word” TV series on Showtime. Yael had been performing with her father since she was three years old, singing country songs and Irish folk songs. At the age of 16, she won first prize in a national contest for the best young singer-songwriter in Israel. Since then she had been chosen to perform as a vocal soloist with the Israeli Philharmonic Orchestra at a tribute concert to the Beatles, directed and conducted by Sir George Martin (arranger and producer for the Beatles). Iconic Israeli artist Shlomo Artzi – one of Israel’s leading singer-songwriters – heard her and brought her on tour with him for two years, joining him on a hit duet of his famous album, “Ahavtihem”. After releasing her second solo album “Joy & Sadness”, Yael was invited by Mashina (Israel’s most highly considered rock band), as a guest star, for a two-year tour and has performed with them all over Israel & the USA. Yael has released three solo albums and has participated in several influential albums in Israel. In the years of 2015 -2016 Yael has found her calling as an activist, initiating the social/musical journey “The Road Home” together with social protest leader Daphni Leef, where the two women drove with a crew of 20 people, for 45 days across the country to document the voices of the good people of Israel. In similar fashion to Joan Baez, she is now on the forefront of a peace movement with an organization called “Women Wage Peace”. The song “Prayer of the Mothers”, which has gone viral with millions of views on Facebook and YouTube, was born as a result of an alliance made between Yael and the leaders of “Women Wage Peace”. The movement arose in summer 2014 during the escalation of violence between Israel and the Palestinians. On October 4th, 2016, Jewish and Arab women began the joint “March of Hope” project. Thousands of women marched from the north of Israel to Jerusalem in a call for peace. 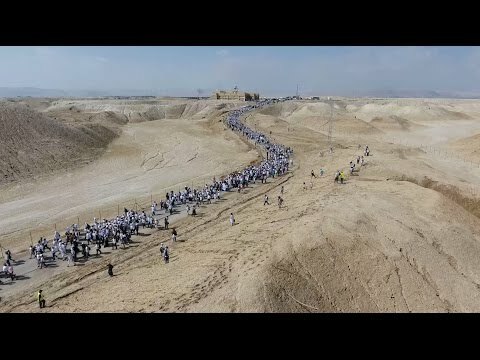 A call that reached its peak on October 19th, in a march of at least 4,000 women in Qasr el Yahud (on the northern Dead Sea), half of them Palestinian and half Israeli. The very same evening 15,000 women protested in front of the prime minister’s house in Jerusalem. Yael was the artistic director of that event. The marches were joined by the Nobel Prize for Peace winner Leymah Gbowee, who lead a peaceful civilian protest to end the Second Liberian Civil War in 2003, by the joint force of women. The song has carried the message of the march of hope all around the world and has ignited many universal women’s movements. The New York Times and Huffington Post UK also featured this whole peace movement as it formed. Don’t you dare miss Yael Deckelbaum’s new release. Yael Deckelbaum one of the best voices we have in Israel ... ’Joy And Sadness’ demonstrates Yael’s phenomenal talent ... Deckelbaum is our folk sixties representative. If you look right you will see the spirit of Joni Mitchell, if you look left you can’t not ignore the bomb of charisma that is responsible for all of this pleasure and if you look forward you will immediately notice the bright future ahead of her. ... meet Yael Deckelbaum.